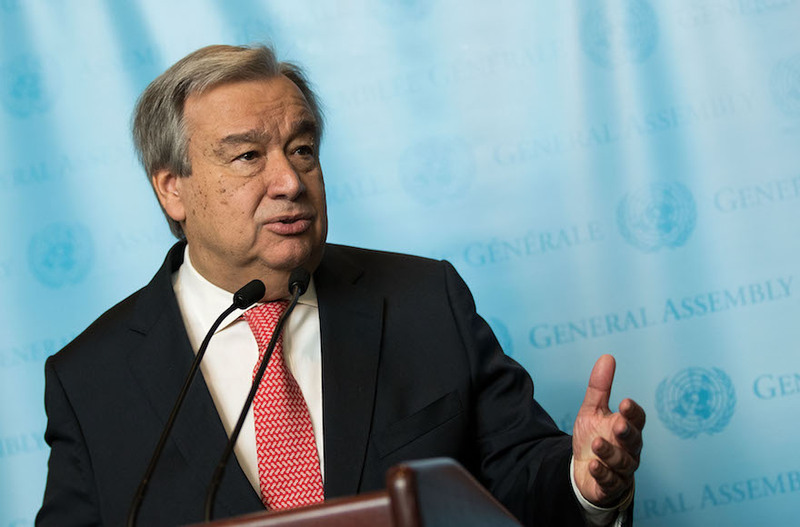 NEW YORK (JTA) — United Nations Secretary-General Antonio Guterres vowed to take action to end anti-Semitism and called the denial of Israel’s right to exist a modern form of anti-Jewish hatred. Speaking Sunday night at the World Jewish Congress’ Plenary Assembly in New York, Guterres said he could not control all expressions of bias against Israel at the United Nations. But he said Israel has the right to be treated like any other U.N. member state. Israeli and U.S. officials, along with supporters of Israel, have long accused the United Nations of irredeemable bias against Israel. According to U.N. Watch, a pro-Israel group that monitors the international body, the U.N. General Assembly condemned Israel 20 times in 2016, compared to six condemnations for the rest of the world combined. But Guterres emphasized that treating Israel fairly “does not mean I will always be in agreement with all the decisions made by any government position taken by any government that sits in Israel,” but adding he supports “the absolutely undeniable right of Israel to exist and to live in peace and security with its neighbors.” He also advocated the establishment of a Palestinian state. The secretary-general, speaking ahead of Holocaust Remembrance Day, called the Holocaust “the most heinous crime in the history of mankind” and promised to marshal the U.N. to eliminate anti-Semitism. “You can be absolutely sure, as secretary-general of the United Nations, I will be in the front line of the struggle against anti-Semitism, and to make sure the United Nations is able to to take all possible actions for anti-Semitism to be condemned, and if possible, eradicated from the face of the earth,” he said. Speaking the same day that right-wing populist Marine Le Pen advanced to the final round of France’s presidential election, Guterres decried rising anti-Semitism in the United States and Europe, which he said was fueled by populism.